See our price list of trailers through the Designer Boats Australia’s Dunbier Agency. 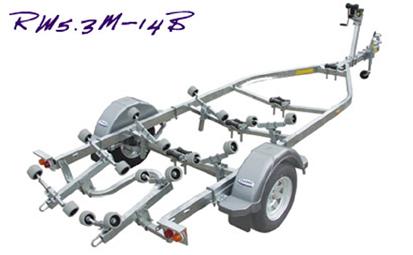 DBA recommends this trailer for the 5.460m Crescent-Bass, as it has a keel running up the centre of the boat and all the loads/weight are transferred through the keel into the rollers. This Trailer can be picked up with your flat-pack or separatly from the Dunbiers Depot.